Winter 2015, will it ever end? Weather professionals may find themselves stealing the NCAA’s catchphrase “March Madness” to describe this month’s record setting snowfall and low temperatures. Today, Winter Storm Thor tracks across the Mid-west, South and East with significant snowfall and ice. Some drivers on Interstate 65 in Kentucky have been stranded for hours due to Thor’s heavy snowfall. In Memphis and in other parts of the South people are experiencing icy conditions and folks in Dallas woke up to 2 to 5 inches of new snow, with Grapevine Texas actually reporting 7 inches. In Dallas, the storm has broken records dating back to the 1940s. Philadelphia and D.C. are expected to receive 5 to 8 inches today and the New Jersey State Trucking Association just sent out an alert to its members letting them know of a declared State of Emergency in that state. The bad weather brings more awareness of the importance of removing snow from the tops of all vehicles before heading out on roadways. Some states, including Connecticut and New Jersey, already require this, not just for buses, trucks and trailers, but also for passenger vehicles. More states are passing accumulated snow removal legislation and those that already have it are citing drivers more frequently. I was reminded of this recently when a freight company told me that one of their drivers was stopped in Connecticut for having accumulated snow on the top of the trailer. They were fined $1,000 and the driver was detained until he climbed up on to the trailer and manually removed the snow—expensive and unsafe for the truck driver. For trucks, buses and trailers, TrucBrush® is a mobile, fast and effective method to remove snow from vehicle’s rooftop. 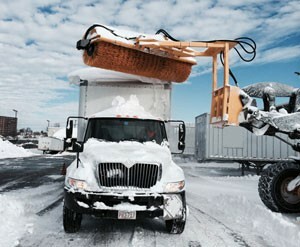 “The TrucBrush has been a pivotal component to our fleet when dealing with a New England winter,” said TrucBrush customer Jarod Warsofsky, General Manager of Boston Trailer. “The savings we have gained from significantly reducing down time has made this investment well worth it… Now we can effectively clear 20 to 30 trailers with TrucBrush in the amount of time that it would take us to shovel one manually,” he said. Keeping roadways safe for all vehicle traffic continues to be a top priority for many in the trucking industry. Our company works with companies to help them successfully implement TrucBrush, whether they are performing the service themselves or working with their snow management vendor to provide this additional winter service.